Guy was born into a wealthy Brewing family in Worcester. He was the son of Herbert William Spreckley and Florence Lesingham Bailey.They had married in Lewisham, London, in the December Qtr. of 1886 (Vo, 1d, Page 1559). They had four sons. Herbert Malcolm, Arthur Freer, Guy Lesingham and Ralph Lesingham. Herbert Malcolm was the only one to have survived the war. I am especially grateful to family member Chris Johnson who, through www.ancestry.co.uk provided me with the following family history. “All four sons enlisted for the First World War. The eldest, Herbert Malcolm born 1887, made a career in the Navy, joining in 1907, and reaching the rank of Commander, on 1922. He married in 1928, & had 2 children, and died 1974. Regrettably, the remaining three boys were all killed in service. The next eldest, Arthur Freer, was a Lt. in the Royal Gurkhas, and Capt.in the Indian Army. He married Ada Blanche McMinn in Bengal in Sept 1912, and had a daughter 1914, and son 1915, both born in India. The family returned to England in 1915, and were due to return to India in November 1915, but the son was poorly, so was left behind whilst the rest of the family sailed on SS Persia. They never made it. The ship was torpedoed in the Eastern Med. The last seen of the family was the mother frantically seeking the daughter, around the decks of the ship, followed by the father seeking the mother. They were never found. The son survived & married my sister. Unfortunately he died last year having had a good innings, but his wife lives on, and is happy to chat with you if you wish. She is aged 81 but looks & acts a lot less. 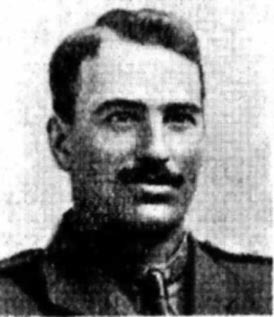 Guy, as you are aware, enlisted in 1914, and joined the Kings Royal Rifles in 1915, achieved the rank of 2nd Lt. and was killed in Fontaine in April 1917, whilst leading a bombing party. His interest was farming, and was a farming cadet in New Zealand prior to the War, but returned to England to enlist. I do not know of any reason for him to come to Flintshire, other than when he returned to England when wounded in 1916, perhaps he was recuperating in North Wales. Another source of information was Sandie from The Great War Forum (http://1914-1918.invisionzone.com/forums/index.php). He gave me some background information on the Spreckley family. He told me that .. The 1891 census records the family living at No. 1 St. George Square, Worcester. Herbert W. Spreckley, 38, was head of the household and a Brewer (Proprietor). His wife was Florence L. who was 30. Their listed children were Herbert M. 3?, Arthur and Guy L, 1. There were 4 Servants. The 1901 census places the family living in Baskem (?) House, Warbourne Road, ( Next door but 1 to the Brewery), Worcester. Herbert W Spreckley, 43 was a Director of the Brewery. Florence L was 40. Their son Ralph L, was 7. There were 2 visitors, Bertram E. Blanchard, and Esther Bromley, Again there were 4 servants. Meanwhile in 1901 Guy was a pupil at “Winchester House”, Staveley Road, a School in Eastbourne aged 11. Guy is not listed on the 1911 census and this would be the time he was in New Zealand. After all this family history, I cannot find out why he was in Flintshire and who made sure he was remembered in Hawarden and Broughton. Perhaps Chris Johnson was right and Guy was recuperating from injury in Flintshire. Warren Hall was at one time owned by the Gladstones. The Hall features in the story of Captain Charles Whitley who is also named on this memorial. Can anyone help us with the role that Warren Hall played in WW1? British Army WWI Medal Rolls Index Cards, 1914-1920 accessible on www.ancestry.co.uk details his medals and tells us that Guy’s first Theatre of War was France and he entered it on 14th November 1915. The card included his father’s name as H.W. Spreckley, Cove Cottage, Worcester. England & Wales, National Probate Calendar (Index of Wills and Administrations), 1858-1966 about Guy Lesingham Spreckley says that he left effects to the value of £1227..13s..0d to his father. There are only two men from Broughton actually at the Front, namely, Richard Herbert JONES (6th Dragoons) and Richard LLOYD (Army Service Corps), but there are several from our immediate neighbourhood either preparing to go, or attending to the wounded. Mr. MAYHEW’s four sons, Mr. Ewart MITCHELL, Mr. SPRECKLEY, and Mr. KINSALL are in training; the butler from Warren Hall is engaged in R.A.M.C. work in the South: Mr. Page is rejoining the Territorials in which he previously had three years training, and Mr. Whitley’s joining the Royal Medical Corps. Mr. BODSWORTH’S son has, for some years, been attached to the London Hospital, at which 600 beds have been alloted to the wounded. The bell in the tower of St. Mary’s church is rung every day at noon to call all who hear it to join in prayer for our sailors and soldiers. We shall be glad to have the names of all men from Broughton and Bretton who are engaged in any way in the war, that we may make a complete list of them. The names, with the titles of the regiments or ships to which the men belong, may be placed in the F.W.O. box in the church by their friends.